BEST VACATION BALCONY VIEW EVER!! Sit on expansive balcony with access off of every room and watch the emerald waves from morning to sunset. Relax beachside and enjoy the sugar white sand and famous emerald green water of Destin. Sip a drink and order lunch from the poolside restaurant or beach tiki bar and grill while you enjoy an afternoon break on the oversized pool deck overlooking the gulf. Slip into the hot tub to really wind down. Sleep with your door open and listen to the waves. Located on 9th floor overlooking pool and gulf view. The location of my unit in the 07 stack (907) has one of the most desired views at Surfside plus the larger 2nd bedroom. New tile thur out condo and new living room furniture. NEW FLAT SCREEN TV in living room to watch from recliner chair just like at home. FREE INTERNET. Fiber Optic Cable 100 Plus megabytes for multiple device streaming. Surfside has one of Destin's few outdoor heated pools with a very large deck area including two hot tubs, separate kiddie pool, and saunas. You can watch your teenage children swim at the pool from your 9th floor balcony. Surfside has 2-lighted tennis courts, basketball court, exercise facility, beauty salon and onsite massage spa. Golf course right next door. Unit is on the preferred poolside with fantastic Gulf View! Staying at our unit includes a free beach service set up with large umbrella & 2 chairs during March 1 - October 31. There is a balcony off every room with wonderful ocean views. Surfside has 24-hour security with all hallways inside the building leading to units. Approximately 1200 square feet. King-size master bedroom with NEW MATTRESS purchased Jan 2019 has its own walk-in closet and private bath with WASHER & DRYER. The second bedroom has a two double full size beds and is next to bath off hallway with 2nd private entrance. Living room has full size sleeper sofa for 2. Master bedroom also has a sofa to watch TV comfortably in addition to the living room area. Eat in kitchen table or plus formal dining room table. Kitchen fully-equipped to cook a holiday meal. Extensive use of mirrors and plenty of natural light. Professionally decorated. Three TV's and two DVD's. 2 beach chairs and umbrella included March 1 - October 31. Our family consider ourselves Big Sky Cajans. Originally from Montana taken to the deep south of Louisiana , beautiful Virginia and southern Ohio with my husband's pulp and paper career the white sands of Destin, FL have found a way to create a tug of war on our hearts between retiring on Flathead Lake, Montana or the sugary white sands of Destin, FL. Hopefully, if you stay at our condo you can help us decide on the retirement vote. We hope you enjoy our beach home get away as much we do. Never tire of looking at the Gulf view from our balcony. When my mom was still alive but unable easily walk to the beach she still felt like she was on vacation when she sat out on the balcony. Fell in love with the warm Gulf water and white sand. 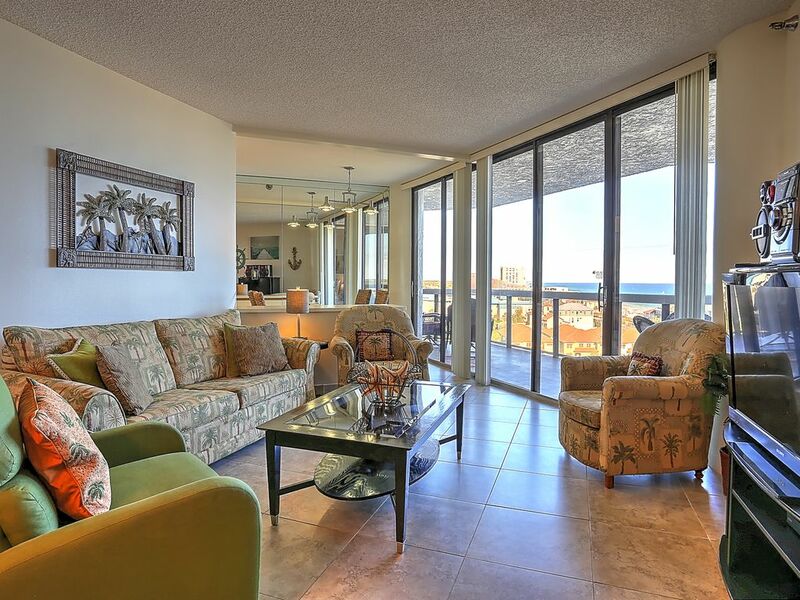 Loved the balconies off every room giving Surfside condo's plenty of natural lighting. We hope to retire here someday. Surfside's unique feature in having balconies off every room in all of its condos. Our condo on the 9th floor offers a spectacular view of the Gulf Mexico plus it is on the pool side. Full view balconies makes it easier to keep on eye on older teenage children that you might allow to go to the pool without mom & dad. We never tire of the view! Love the heated outdoor swimming pool, one of the few in Destin with hot tubs.. Makes for comfortable year around swimming. Also, one of the few condos with saunas located in the pool bathrooms. There is a fitness center with new equipment. The onsite restaurant & bar a big plus which also has outdoor restaurant seating. Unbeatable gulf view weather seated inside or outside. Sushi bar is one of the best in Destin. It is just a push of the elevator button away. There is also an outside Beach Bar on the deck of the skybridge. Told it has the best on the beach drink prices! Master Bathroom has shower and wash machine & dryer in closet of bathroom. 2nd Bathroom has bath tub/shower combination. Walkway across road for safe beach access. New beach bathrooms underwalk way in front of resort. Code provided at check in from front desk in lobby. Beach Bar on walkway. All beds will have sheets & pillow cases on them when you arrive. Extra set for pull out couch is in master bedroom closet in square plastic container with handle. Call if not there. In closet off master bathroom. 8 bath towels 8 hand towels & 8 wash cloths Pack your beach towels. Well stocked. Could cook a holiday dinner. Dining table has 6 chairs but you can move the other 2 over to dining table if you want 8 people to dining together. Small selection of books to read. Please try & remember to put back for another renter to read. Small selection in cabinet below TV. Full length of condo unit with door access off every room. FREE WIRELESS INTERNET ACCESS, DVDs, fully-equipped fitness center, tennis court, Beach set up with umbrella and 2 chairs included. Massages & Hair salon located on 1st floor towards right hall when leaving elevators that take you to the pool. Details of this awesome unit. God Bless all who visit. The condo was very nice with a lot of room. The balcony and view were spectacular from the 9th floor. The elevators were fast only had to wait a minute or 2. Great location. The restaurant in the condo building was very good and convenient to get a late dinner. very family oriented a lot of families in the condo and on the beach. Only complaint was the two double beds were hard and squeeked. Everything else was perfect. Thank you for letting us rent your beautiful place! I would definitely recommend it! Surfside 907 is great!! Our second stay in this unit. Sylvia is great to work with. Lots of extras in the condo... soap, trash bags, plenty of pots and pans, dishes, etc. Like a home away from home!! Will be staying there again. Surfside Resort is a great place and the addition of the street level restrooms is a huge plus!! Happy my condo still met your expectations and that you are planning on returning again. After staying at Surfside Resort it is hard to find a resort that you will like better. Strife to keep my condo up and the rent at an affordable rate for families. We loved our stay in this fantastic condo over spring break. Sylvia had everything we could possibly need for our stay in every room. We loved the view and all the amenities. The heated pool was amazing!. Beach chair service was great; beautiful beach, easy access. Everything was wonderful. Sylvia went above and beyond to make our spring break A+. Highly recommend this rental and Sylvia. Thank you Sylvia! Thank you for the kind comment. I try hard to make a vacation stay at our condo in Surfside Resort a good memory for my renters. Surfside is really a great place for families. The location to shopping and restaurants is hard to beat. We discovered Surfside in 1990 as renters ourselves and could not find floor plans of any other condo that we liked better for the views & natural lighting when we decided to buy in the Destin area. Condo was fantastic. Exactly as it was described. Very clean and plenty of room for our family. Restaurant was very good. The fitness room was nice. The heated outdoor pool and hot tub were perfect for our kids. The owner was fantastic to work with. She called within minutes of booking to inform me of everything regarding the condo and talk about the area. I would highly recommend this to anyone looking for a great place to stay in a beautiful area. We will be going back! Thank you for taking time to write that you enjoyed the stay at our condo. Hope you become one of the many returning families that book our condo year after year.